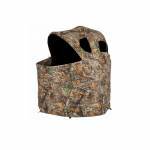 Ameristep Tent 2-Man Chair Blind - Realtree Edge. Tent chair blind is ideal for firearm and crossbow hunting. No assembly required. Realtree Edge camo pattern Front and side zippered windows Chair is attached to blind, no assembly required 61" W x 52" D x 60" H ..
Ameristep Tent Chair Blind - Realtree Edge. 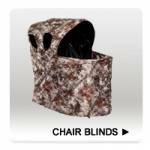 Tent chair blind ideal for firearm and crossbow hunting. No assembly required. Realtree Edge camo pattern Durashell Plus fabric shell 34" W x 45" D x 54" H ..